Can the Parramatta Eels end the nightmare? There's plenty of 'newness' at the Parramatta Eels for 2014... so Classic Footy Films takes a look at the team for next season. How do you think the 'New Eels' will go in 2014 Parra fans? 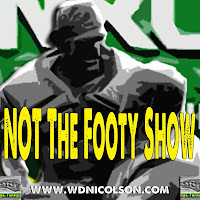 Now you can still subscribe to our NOT The Footy Show Podcast on iTunes here and although we're not sure if or when we'll be back on air again, it doesn't hurt to be prepared right?